Prism 200 just the latest way to see through walls; this article shows you three more. 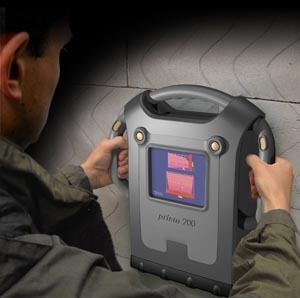 Prism 200 is handheld, through-the-wall radar; it is "designed for situations where a high degree of insight is essential for success." This according to the designer, Cambridge Consultants. To extend the flexible operation of Prism 200 a Laptop Application has been developed that allows the user to remotely monitor and record the intelligence gathered. Depending on what you see, it might be a good idea to walk away and monitor the situation remotely. I promised you three more ways to see through walls, and here they are. 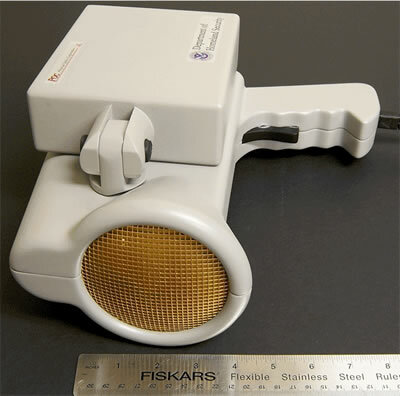 The LEXID device acquires and focuses backscattering photons from hidden objects that are irradiated by the beam coming from the device (a low power x-ray generator)... (more). LifeReader is able to accurately detect and monitor heart and respiration activity of multiple subjects wirelessly, with no contact to the subjects (more). 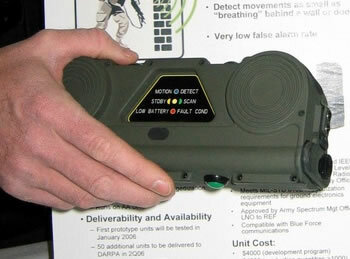 The DARPA Radar Scope is expected to be in use in Iraq by spring of this year; held up to a wall, users will be able to sense movements as small as breathing up to fifty feet into the next room (more). You might also want to check out DARPA's Harnessing Infrastructure for Building Reconnaissance (HIBR) project for yet another (bonus!) way to see through walls.